So I thought I would kick off the new year by getting rid of things I have lying around that are seldom used and gathering dust. Makeup, clothes, home decor, and toys were making their way into the “donate” pile. This quickly became an exercise in self reflection. At first I felt the urge to justify keeping things, thinking, “Oh I’m sure I’ll use this soon.” But as my stack began to grow, the buzz of having more space and simplifying my home began to kick in. Before I knew it, I was happily tossing things in. I began to feel more energized, and it occurred to me just how long it had been since I felt that way. I realized that not only did I need to declutter my house, I needed to declutter my life. It wasn’t just about “things” zapping my energy. Unhealthy habits, relationships, and priorities can throw everything off kilter. They steal our time, energy, and quality of life. And just like justifying the keeping of unnecessary things, we legitimize those habits by saying, “It’s not that big of a deal.” We defend unhealthy relationships with family, friends, and partners, thinking, “It will get better.” We excuse skewed priorities with, “I’ll get to it later.” But later never comes. Not that way. Later is now. This moment is what we have to work with. Maybe “it” is that big of a deal. And how can things get better without correction? Ask yourself honestly what (or who) needs to go, needs to change. Even if the one who needs to change is you. Change is scary, but what scares you more? Changing…or staying the same? What will you “declutter?” Leave a comment below. Thanks for reading. Posted in Beauty & Style, Mombomb, Soul Food for Thought, Wellness and tagged blah, change, clean, declutter, engery, Family, Health, help, improvement, Life, Mental Health, newyears, priorities, reflection, relationships, resolution, self, Stress. Bookmark the permalink. Since my last toxic makeup review was on a high-end brand (Urban Decay-to read it, click here), I thought I would review a popular drugstore brand next. Below is a quick rundown of some of Revlon’s best and worst rated makeup products. The ratings were obtained from the Skin Deep database by the Environmental Working Group (which can be found at www.ewg.org/skindeep). The rating scale is simple, ranging from 0-10 with 10 being the most toxic product score. As always, please keep in mind that formulations in cosmetics are constantly changing. Consequently, I encourage looking up product ratings before you buy them either on Skin Deep or www.goodguide.com (which also includes the company’s eco and social responsibility ratings). While Revlon has quite a few low-toxin products (168 out of the 1022 current products rated), overall most of their products were in the moderate or high toxin range. 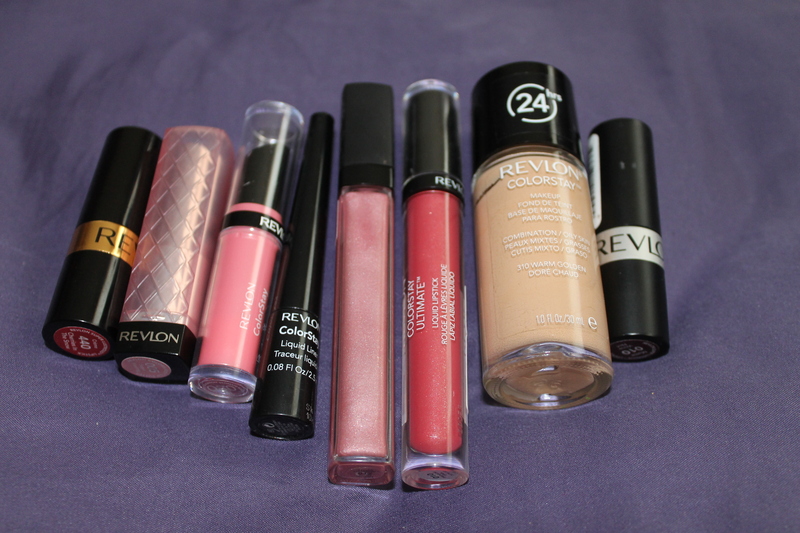 For the sake of brevity I did not list all 1022 products, but here are various examples of Revlon’s products and their ratings, starting from the worst scores. 10: Hair color. Do you really want this absorbed into your head? Please note I did not include products considered by Skin Deep to have an old formula (more than 3 years old), and also that not all shades of the same product will have the same score. Approx. 16.4% of the products I viewed were low toxin, which is honestly more than I thought there would be. But Revlon can certainly do better! Poor scores resulted from toxic ingredients such as multiple parabens (linked to reproductive toxicity, hormone disruption), BHA (linked to cancer, organ toxicity, hormone disruption), methyl methacrylate (linked to developmental toxicity, for example, fetal exposure in utero, breastfeeding infants, direct application exposure while still developing), and many more. Good Guide (www.goodguide.com), which rates product health, social, and environmental responsibility 0-10 (but with 10 being the best, no-toxin score) gives Revlon the following overall ratings: Health 1.9 (extremely poor), Environmental 3.9 (poor), and Social 3.9 (poor). Visit their website for more information. What did you think of Revlon’s ratings? Were you surprised? Please leave a comment below with your thoughts, questions, and requests for other brand reviews. Be good to one another and thanks for reading. Posted in Beauty & Style and tagged Beauty, BHA, Campaign for Safe Cosmetics, chemicals, Cosmetics, Environmental Working Group, good guide, Health, low toxin makeup, makeup, parabens, review, Revlon, Skin Deep, somethingtoconsider, somethingtoconsider1, somethingtoconsiderblog, toxic makeup, Wellness. Bookmark the permalink. 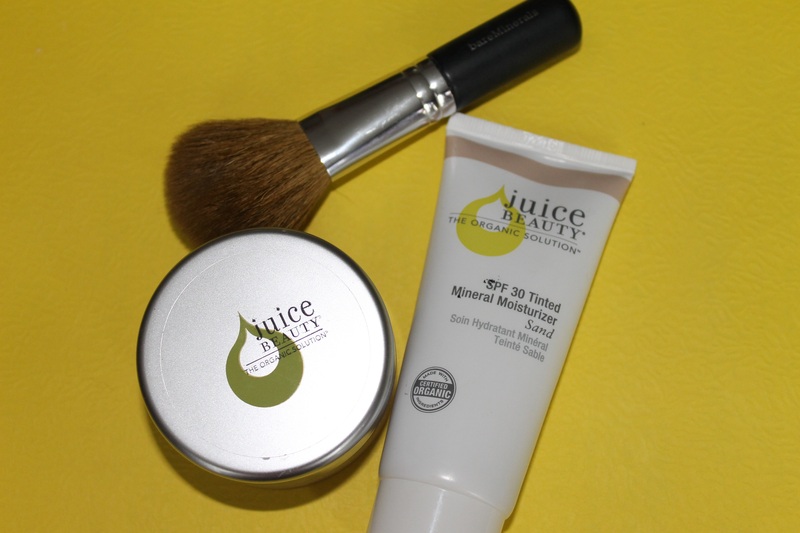 Up for your consideration are the Tinted Mineral Moisturizer and Refining Finishing Powder by Juice Beauty. I spotted these in Ulta awhile back, and since I’m always on the hunt for effective low-toxin products, I thought I would give theses a shot. Here’s a bit of background on Juice Beauty in case you are unfamiliar. Founded in California, their goal was to create healthy and effectual personal care products. They have created antioxidant and vitamin-rich, organic, juice-based formulas that strive to be more effective than their high toxin-counterparts. Using juice as a base eliminates the need for petroleum derivatives that many other companies use, which suffocate the skin and frequently contain harmful chemicals. Juice Beauty is a certified organic brand, so you can purchase their genuinely natural ingredients with confidence. But enough chat about the company. How well do the products actually work? For the tinted moisturizer, I dot it all over my face with clean fingers and then massage into the skin. I usually then go over it with my Bare Minerals precision face brush just to even it out. I apply the refining powder with the Bare Minerals flawless face brush, tapping off any excess product into the cap. If you’ve been burned by tinted moisturizers that lack any semblance of coverage, this will not disappoint you. However, if you are in search of a full coverage product, this (or any tinted moisturizer for that matter) is not the item for you. While the price point is a bit steep (the tinted moisturizer retails for $29 for 2 oz of product; the refining powder goes for $22 for .28 oz), you get plenty of product. Could the health score of the tinted moisturizer be better? Of course (in the darker shades that is). So if you are really uncomfortable using anything other than low-toxin products, you will want to pass on this. Overall I think you get what you pay for: high quality, natural products that do pretty much what they say they do. And if you purchase them from Ulta and are dissatisfied, you can return them for a full refund or store credit (at least here in The States). Have you tried them? Leave a comment below with your thoughts and skin type. Of course I purchased these with my own money and these thoughts are my own. Thanks for reading. Posted in Beauty & Style and tagged bb cream, Beauty, combination skin, dry skin, face powder, Health, juice beauty, low toxin makeup, makeup, Moisturizer, Natural, natural makeup, oily skin, organic, organic makeup, products, refining finishing powder, skin care, skincare, something to consider, somethingtoconsider, somethingtoconsider1, somethingtoconsiderblog, tinted mineral moisturizer, tinted moisturizer, Ulta. Bookmark the permalink. Hello, Lovelies! I’m back with another makeup brand review. I previously reviewed E.L.F. Cosmetics (to read this review, click here). This time we are looking at Urban Decay and spotlighting some of their best and worst health rated products. As usual I use www.goodguide.com and www.ewg.org/skindeep to get these ratings. Below I have listed current ratings as of this writing. Don’t forget: product formulations are constantly changing so you may want to double check scores before purchasing. For Good Guide (gg), 10=no toxin, 5-9=low toxin, 3-4=moderate toxin, 0-2=high toxin so the higher the number the better. As for Skin Deep (sd), the ratings are opposite of Good Guide; 0=no toxin, 1-2=low toxin, 3-6=moderate toxin, 7-10=high toxin so the lower the number the better. I included prices if available, but don’t fret, ebay and amazon are always loaded with discontinued makeup. I included ratings on d/c’d products in case you have them in your stash. Let’s highlight some of their low-toxin products first. Urban Decay has quite a few low-toxin products. Lipsticks in the following shades: gravity, trainwreck, jilted, vinyl, voodoo, wanted, buzzkill, requiem, revolution, midnight cowboy, lovechild, hot pants, rush, sellout, naked, apocalypse, peroxide, confession, and gash (gg 6+); *note: these are the old lipsticks, not to be confused with the brand new Revolution lipsticks that, to my knowledge, have not yet been rated. It would take too long to list all 500 or so poorly rated products, so I’ll highlight a few. These bad scores are due to ingredients such as silica, butylated hydroxytoluene (BHT), propylene glycol, triethanolamine, and multiple parabens. These are linked to health concerns such as cancer, organ toxicity, hormone disruption, and cellular level changes. Overall, Urban Decay health product ratings are 2.8, their social responsibility rating is 3.2, and their environmental responsibility rating is also 3.2 (none too impressive). So judge for yourself if Urban Decay is the right brand for you. Most of their low-toxin products, while costly, are highly pigmented, beautiful, and have great staying power. And remember that not all high-end makeup makes for good health quality products. What are your thoughts on Urban Decay? Leave a comment below. As always, thanks for reading. Watch my video on this topic! Posted in Beauty & Style, Wellness and tagged All Nighter, Beauty, blush, cheek tint, Cosmetics, deslick, eyeliner, eyeshadow, Health, high toxin makeup, lip liner, lipstick, low toxin makeup, makeup, mascara, Midnight Cowboy, naked 2 palette, naked palette, review, setting spray, Shopping, something to consider, somethingtoconsider, somethingtoconsider1, somethingtoconsiderblog, Urban Decay. Bookmark the permalink. Of all the clients I have seen over the years, one of the most common problems people have come to counseling for anxiety. According to the Anxiety and Depression Association of America, anxiety disorders are the most common mental health issue, affecting approximately 40 million adults each year. To a certain degree, anxiety is a perfectly normal reaction to stress. For example, if you have a big exam coming up at school or an important presentation at work, anxiety and nervousness are natural responses. However, if an anxiety response causes substantial emotional impairment or distress, a person may be dealing with an anxiety disorder. For more information on anxiety and how to help ease the symptoms, keep reading. While anxiety has many forms (listed below), this article focuses on anxiety in the general sense. The Diagnostic and Statistical Manual of Mental Disorders describes Generalized Anxiety Disorder as extreme and frequent worry that is difficult to control and causes impairment in functioning in at least one area of a person’s life (that is not caused by a medical issue or substance use). Symptoms can include feeling edgy, cranky, and drained; having difficulty focusing, muscle tension, and trouble sleeping. Remember that each individual is different so anxiety may not look exactly the same from person to person. This can be exhausting to deal with for ourselves and our loved ones. In addition to the mental and emotional response to anxiety and stress, our bodies also have a physiological response to stress and anxiety. Naturally, our bodies respond to stress by trying to avoid or eliminate the stressor. The hypothalamus kicks into gear. The pupils dilate, the adrenal glands drive cortisol, epinephrine and norepinephrine throughout the body, the heart rate and blood pressure jump, our bodies burn stored fat for energy and constrict blood vessels in certain parts of the body. This readies us to respond to and survive the threat by fighting, fleeing, or freezing (i.e. the fight-or-flight response). While these automatic functions in the body are invaluable in protecting us from threats, anxiety can enable them by even a perceived threat. If we get stuck in an anxious mindset, anything can become a perceived threat. This can leave our body in survival mode around the clock, when it is only meant to turn on in an emergency. Operating on this mode all the time can actually have toxic effects. No wonder you are having difficulty concentrating and sleeping with all of this going on inside your body! But how can a person get off the anxiety roundabout? We have to engage our minds and bodies for the solution. It all starts in the mind. Ask yourself when the anxiety first started. What was happening at that time? What were you responding to? Sometimes anxiety is (and other mental health issues are) a result of something we’ve been ignoring within ourselves that is trying to get out. We can only stuff it down for so long before it manifests itself. Identify how you respond to the trigger emotionally, physically, and mentally. What are your thought responses to stress? For example, if a teacher or an employer asks to speak to you privately after a presentation, are you assuming that what they have to say is negative? Jot the answers to these questions down. Take your time. If you are having a difficult time answering some of these questions just relax and give yourself a break; you may have to revisit these questions repeatedly, and that is completely normal. Now that you have identified the stressors and your initial responses, let’s get your body under control. When you feel the anxiety start to creep in, the first thing to do is maintain a low heart rate. Take slow, deep breaths. Under stress our bodies want to huff and puff; these shallow intakes can encourage the stress response in your brain. By maintaining your breath you can cut off the anxiety hormones at the pass. Relax any muscles that may have tensed. Try some progressive muscle relaxation; you may be surprised at how many of your muscle groups have been activated. Participate in regular exercise. When we sweat it releases many of the toxins in our bodies and leaves our brains and bodies in a much more restful state. One of the most effective ways to relax the mind and body is through prayer and meditation. Studies show how powerful these are, as people who identify themselves as religious are less likely to become anxious and depressed. In one study, 20 out of 22 participants who practiced prayer or meditation to reduce moderate to severe anxiety showed marked improvement after three months. When we pray and meditate, we use the most advanced part of our brains that is responsible for thinking, reasoning, and problem-solving. These functions are dampened by anxiety from the activation of more primal instincts for survival. Let’s not underestimate the power of our Lord. He designed us this way for a purpose. Now back to our thoughts. Once the anxious thoughts have been identified, challenge and replace them along with any fearful self-talk; exchange them for empowered, positive ones. Analyze how likely the feared event is to occur. You see, our fears are like a plant. They start with one seed, and then we water it by continuing to think and speak fearful thoughts which, many times, are unrealistic. What can you do to control the outcome of the dreaded situation? Remind yourself that you are not as helpless as you may feel. Identify how you might respond to the feared outcome in order to return to a normal level of functioning. And try to stay in the present moment. Anxiety is usually brought on by thoughts of the dead past or the imaginary future. Most of the time we are safe and should not have to feel worried. This can be incredibly difficult at first, but patiently keep returning your focus to the here and now. However, if there is a question of physical safety in your life, contact a helping professional to assist you in getting you to a safe place or situation as soon as possible. Have a loved one or close friend to talk with about the anxiety. Sometimes another person can give us a fresh perspective on how probable a feared event is. They can also hold us accountable to our coping strategies. If possible, this person should not have an anxiety problem as anxiety can be contagious; if we are in close proximity to an anxious person, our brain picks up on their elevated heart rate and will send a signal to the body that something is wrong. This can stimulate an anxious response within us. Also, exposing ourselves to anxiety-provoking material can do this: reading crime novels, watching disturbing movies or television, etc. Again, we are all unique so some techniques may work better for you than others. It can take time to overcome anxiety, so celebrate every small victory you have. The good news is that anxiety is very treatable. Continue to educate yourself on the causes, symptoms, and solutions of and to anxiety with many available books on the subject. If your anxiety is serious, get in touch with a good counselor or licensed therapist. Trained professionals have many additional resources and treatment exercises to help you reclaim control over your thoughts and feelings. I am confident you will find freedom from the plague of anxiety and find your way back to a place of rest. If you would like to see an article about other specific types of anxiety or anxiety in children/adolescents, or for questions, please leave a comment below. Thanks for reading. American Psychiatric Association: Diagnostic and Statistical Manual of Mental Disorders, Fourth ed., Text Revision. Washington, DC, American Psychiatric Association, 2000. Howard, P. J. (2006). The Owner’s Manual for the Brain: Everyday application from mind-brain research (3rd ed.). Austin, TX: Bard Press. Jongsma, A. E., & Peterson, L. (2006). The Complete Adult Psychotherapy Treatment Planner (4th ed.). Hoboken, NJ: John Wiley and Sons, Inc.
Nevid, J. S., Rathus, S. A., & Greene, B. (2006). Abnormal Psychology in a Changing World (6th ed.). Upper Saddle River, NJ: Pearson Education. Posted in Wellness and tagged acute stress disorder, addictions, Anxiety, Anxiety and Depression Association of America, Anxiety disorder, Anxiety Treatment, breathing, Coping skills, counseling, disorder, Disorders, Fear, generalized anxiety disorder, God, Health, help, how to, illness, Jesus, Mental Health, obsessive compulsive disorder, panic, panic attacks, peace, phobia, posstraumatic stress disorder, post traumatic stress disorder, progressive muscle relaxation, psychology, ptsd, relaxation, something to consider, something to consider blog, somethingtoconsider, somethingtoconsider1, somethingtoconsiderblog, Spiritual, substance abuse, Tachycardia, therapy, Wellness. Bookmark the permalink. Preparing for Baby: What’s in My Hospital Bag? As pregnancy winds closer to an end in expectation for birth, one of the to-do list items to check off my list is packing the hospital bag. Whether you are packing your bag months in advance in anticipation, or if you are a procrastinator packing at the last minute, below is what I consider my hospital essentials when having a baby. Small amount of olive oil (I use cold pressed extra virgin olive oil)-put this on baby when changing their diaper. This will help the ever-so-sticky meconium clean off like a dream. Some women like to bring pajamas or robes from home that are more comfortable than hospital gowns. If you do this make sure you are okay with them getting stained by the plethora of fluid that accompanies childbirth. My list may seem very modest. I remember with my first child I completely over-packed as I was not sure what I would need. You may have additional items that are essential for your comfort. Pack whatever you feel you need. I recommend keeping it simple so that packing to go home will be a simpler process. Thanks for reading. Please leave me your hospital bag essentials in the comments below. Posted in Mombomb and tagged Baby, birth, Breastfeeding, California Baby, childbirth, Children, Diaper, Family, Health, hospital bag, maternity, Motherhood, Natural, organic, pregnancy, women. Bookmark the permalink.